The intricate rules that governed life during Holy Week deserved to be housed in a similarly momentous and ornate binding. In cultures all over the world, the first full moon after the vernal equinox is a sacred time. The cover reproduced here protected "L'office de la Semaine Sainte," which explained the many rites and observances to be followed during the most important period in the Christian calendar. The entire surface of the original cover was adorned "à la fanfare," an elaborate, handtooled pattern edged in gilt. "Fanfare," which was a style popular from the late 1500s until the early 1700s, required tremendous skill on the part of the bookbinder and was reserved for books of great importance. Our cover, featuring a tendril motif, reproduces a 1688 binding from the Düsseldorf Museum Kunstpalast. 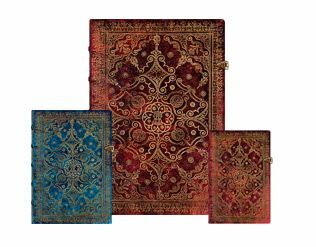 Paperblanks Equinoxe Azure Ultra UNLINED. Paperblanks 5-Year Snapshot Journal Carmine Ultra.